The Rohrer & Klingner Bottled Fountain Pen Ink comes in a wide selection of colors to choose from. Perfect for fountain pens and quills, Rohrer & Klingner inks continues an old tradition of ink production. Featuring brilliant colors made from minimal additives for a well balanced ink. Two colors are iron gall inks, Salix and Scabiosa. 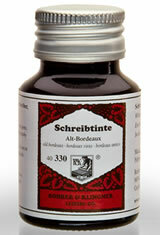 The Rohrer & Klingner Bottled(50ml) Fountain Pen Ink usually ships within 1 business day unless otherwise specified. Each Rohrer & Klingner Bottled(50ml) Fountain Pen Ink we sell is guaranteed to be genuine, authentic and will arrive brand new & unused! I purchased Scabiosa because I was looking for a purple ink that wasn't screamingly obtrusive, and I'm pleased to say that Scabiosa hits the right spot. It's a lovely dusty, vintage-y, unsaturated purple that has just enough colour to be interesting on paper without calling too much attention to itself. The fact that this ink holds up under a thorough soaking (never mind a drip test) is the proverbial icing on the cake. I bought "Scabiosa", which is an iron-gall-based ink in a dusty purple color. It has excellent water resistance, great flow, pretty good feathering resistance on good and above average paper, and thus far has been very low maintenance for my pen. Great value too! I also really like the bottle: it has a minimalist design, dark brown glass with a contrasting satin-matte bright aluminum twist-off cap. The Rohrer & Klingner Cassia is just one of the prettiest purples out there. A nice shade that to me looks like a bright, true purple. Great ink. Love the color! Product was exactly a described. Are these water proof or marker-safe? The only Rohrer & Klingner inks that are water proof are the Salix and Scabiosa colors.